Identification. The United Arab Emirates (UAE) consists of the seven small emirates of Abu Dhabi, Dubai, Sharjah, Ras Al-Khaimah, Ajman, Umm Al-Qaiwain, and Fujairah, which were united as a federal state on 2 December 1971. Before the establishment of the oil economy in the early 1960s, two main orientations shaped traditional Emeriati culture: the nomadic desert-oriented Bedouins with small oasis farming within the broader context of the desert economy and culture, and the sea-oriented culture that revolved around pearling and sea trading. These subcultures were economically, politically, and socially interdependent, creating a common culture and social identity. The UAE shares significant aspects of its culture with neighboring Arab countries and the larger Arab culture. Location and Geography. 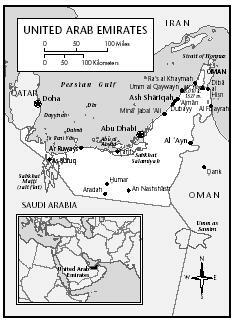 The UAE covers 32,278 square miles (83,600 square kilometers) and is located on the Arabian (Persian) Gulf. It shares land borders with Oman, Qatar, and Saudi Arabia. The seven emirates vary greatly in size. Abu Dhabi represents 85 percent of the land, and the smallest emirate is Ajman. Each emirate is named after its capital city, and Abu Dhabi City is the permanent capital of the nation. The inland area is mostly desert with a few oases, and the barren Hajar Mountains run through the country. The UAE has a dry climate with very high temperatures and humidity in the summer. Demography. Relative to its size and oil wealth, the UAE has a small population, estimated at 2,624,000 in 1997. Before 1970, the local population was tiny (estimated at eighty-six thousand in 1961) and lacked most of the technical skills needed for a modern society. The commercial production of oil triggered rapid population growth as a result of an increase in the national population from improvements in diet, health care, and living standards and the importation on a large scale of mostly male foreign laborers. The latter factor has generated a dependence on expatriate labor; the UAE has become a multiethnic society, and Emirati nationals account for only about 20 percent of the population. This has created an imbalanced population composition in favor of males; in 1997, there were 1,755,000 males and 869,000 females. About two-thirds of the immigrants are Asians, mainly from India, Pakistan, Iran, Sri Lanka, Bangladesh, and the Philippines. The remainder are Arabs, Europeans, and Americans. Linguistic Affiliation. The official language is Arabic. Among the immigrant population, English, Hindi, Urdu, Farsi, and Filipino are spoken. English is the language of commerce. Symbolism. National Day symbolizes one of the most successful experiments in unity in the modern Arab world. The main metaphor is that of the family, with the president referred to as a father. The colors of the national flag—green, red, white, and black—are shared with other Arab countries. Other cultural symbols are the falcon, camel, Arabian horse, pearling boat, coffeepot, and date palm. They are used to invoke a historical community that survived harsh conditions and now enjoys the benefits of unity and prosperity. These emblems appear on banknotes, coins, and stamps. the Indian Ocean. This led to the settlement of different ethnic groups from countries along the trade routes, such as Iran and India. Trade activities with east Africa led to the importation of Africans as laborers in the pearling industry in the late nineteenth century. The African and Iranian ethnic populations have been fully integrated as citizens. Before 1960, the only settlements were small towns and villages. Oil resources have enabled massive modernization. Towns have been transformed from mud-walled communities into commercial capitals integrated in the global economy. Because of the small population and harsh desert interior, 80 percent of the population lives in the coastal capital cities, leading social scientists to describe them as city-states. Urbanization has been characterized by unparalleled growth. Abu Dhabi is one of the most modern cities in the world. UAE cities have been heavily influenced by the global city type. Dominant urban features include skyscrapers in the commercial city centers, multistory residential buildings, large shopping malls, wide boulevards, an extensive network of highways, and sprawling new suburbs. The cities have a multiethnic composition, with segregated housing areas for nationals and the immigrants. Housing is subdivided further according to class, social power, ethnicity, and nationality. To create a balance between their global and local aspects, in municipalities have adopted policies projecting Arab-Islamic architectural design, particularly arched windows, gates, and decorative stucco. Recently, more urban settings have exhibited decorative designs with local themes related to the national heritage. Preservation of the urban heritage also is seen in the renovation of old forts, palaces, souks (marketplaces), and mosques. Date palm trees, symbols of the local culture, have been planted extensively along city roadsides. Food in Daily Life. Before the 1960s, food consisted mainly of fish, rice, bread, dates, yogurt, homegrown vegetables, and meat from sheep, goats, and camels. The diet has improved in quality and variety, with modern supermarkets offering imported foods. Lunch is the main family meal and is eaten at home at around two o'clock. It usually consists of fish, rice, meat, and a vegetable dish. Many Emiratis prefer the traditional style of eating with the right hand. There are strict Muslim taboos against pork and alcohol, and meat must be slaughtered according to the Islamic halal method. Emiratis are known for their hospitality; they feel honored when receiving guests and socializing with friends and relatives. Guests are welcomed with coffee and fresh dates. Incense is passed around so that guests can catch the fragrance in their headwear. With the immigrant population have come restaurants offering a wide variety of ethnic foods, and fast-food restaurants have also become popular. Basic Economy. Income is among the highest in the world, but there are large differences between the emirates, with Abu Dhabi, Dubai, and Sharjah producing the most oil. The other emirates have benefitted from oil wealth through the federal welfare system and employment in state institutions. With declining oil prices, the government has attempted to diversify the national economy. This has led to the growth of industry, construction, commerce, free trade zones, transportation, tourism, farming, fisheries, and communications. The rapid development of these sectors has reduced the nation's dependence on oil. In 1998, the gross domestic product was estimated at $45,590 million, 70 percent from the nonoil sector. The national currency name is called the Emirian Dirham. Major Industries and Trade. The UAE is the third largest exporter of crude oil and gas in the Gulf. It is a member of the Organization of Petroleum Exporting Countries (OPEC). Division of Labor. Citizens account for 10 percent of the total labor force. Almost all nationals (99 percent) work in the state sector because of the attractive benefits and are employed mainly in nontechnical jobs in education, the army, the police, and the civil service. They also own all Emirati businesses. Immigrants are employed in both the public and private sectors in manual, technical, and professional occupations. Classes and Castes. Emirati society is divided into two social categories: the nationals ( Al-Muwateneen ) and the foreign immigrants, referred to as the incomers ( Al-Wafedeen ). Citizens are subdivided into four main social classes: (1) the ruling sheikhly families, whose members hold the highest political positions and power and have immense wealth and prestige, (2) the merchant class, known as al-tujjar , traditionally pearling merchants who now sell international consumer goods, (3) the new middle class, represented by increasing numbers of professionals who have benefitted from free state education, and (4) the low-income groups, represented by newly settled Bedouin nomads and former pearl divers and oasis farmers. Among the immigrants there are hierarchical groups that receive different economic and social rewards: (1) top professionals and technocrats with international contracts, who earn high salaries and other benefits, (2) middle-range professionals such as school teachers, skilled technicians, and company salesmen, and (3) low-paid semi-skilled and unskilled workers, primarily Asian. In general, nationals are a privileged minority, and benefit from state laws and business regulations. Symbols of Social Stratification. The symbol of a male national as a distinct social category is seen most visibly in the traditional dress of a white robe ( kandoura ) and white head cloth ( ghutrah ) with a black rope ( aqal ). Men grow short beards and mustaches. 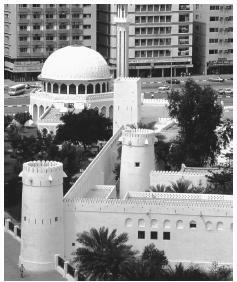 An old fortress surrounded by modern buildings in Abu Dhabi. After 1960, mud-walled communities transformed into commercial centers. Women wear long dresses with a head cover ( hijab ) and black cloak ( abayah ). Government. The UAE has a federal government that is made up of several organs: the president and his deputy, the Supreme Council, the cabinet, the Federal National Council, and an independent judiciary with a federal supreme court. The Supreme Council has both legislative and executive powers and includes the rulers of the seven emirates. The cabinet consists of ministers drawn mainly from the ruling families of the emirates. Leadership and Political Officials. The fact that the traditional tribal system of government each emirate was based on similar political principles facilitated the establishment of the UAE. Hereditary dynastic family rule still operates in each emirate as a local government system under the umbrella of the federal system. Members of the ruling families occupy the most important positions in their political administrations. While the political system continues to retain some of its traditional values at formal and informal levels, it has been able to keep pace with economic and social change. The sheikhs are highly regarded for performing the dual roles of modernizers and guardians of the cultural heritage. They still have traditional majlis where citizens have access to their leaders. The development of the infrastructure has been impressive. The welfare system offers womb-to-tomb free state services for all nationals, including high-quality health care, education up to the tertiary level, social security, family allowances, subsided electricity and water, and housing for low-income groups. This is a major way of distributing oil wealth among the national population. The immigrant population also benefits to some extent, particularly in regard to medical care. There were 103 Associations of Public Benefit in 1999, serving interests of many groups and identified with heritage preservation, immigrant communities, professional groups, culture, women, religion, sports, and general humanitarian services. Their role is seen as complementary to that of governmental institutions. Division of Labor by Gender. Modern economic roles and social status reflect both change and continuity for women. Schools and universities are segregated, and levels of enrollment of girls and their performance are impressive. In higher education, female students outnumber males two to one. However, women's participation in the labor force remains one of the lowest in the world at 6 percent in 1990. In spite of new employment opportunities, most women opt for marriage and raising children. UAE society places a high value on those roles. Conservative cultural attitudes lead women to seek jobs that do not involve mixing with men or commuting far from home. Subsequently, most women are employed in education, health, and civil service. The Relative Status of Women and Men. Official statements affirm that men and women have equal rights and opportunities to advance themselves and the nation, yet patriarchy as a generalized ideology is still visible in social life. Men continue to receive employment preferences in high state administration and private businesses. Women do not play a significant role in politics and religious life, as these areas are considered male domains. Marriage. Arranged endogamous marriage within the kinship (tribal) units was the preferred pattern in the preoil period, but this pattern has changed somewhat. Individuals now have greater choice, yet many nationals still prefer arranged marriages. Emiratis are strongly discouraged from marrying nonnationals, and a young man receives $19,000 from the Marriage Fund if he marries a national. As prescribed by Islam, a man is allowed up to four wives, but most men have only one wife. Domestic Unit. The traditional household unit of the extended family has been undermined, as over 80 percent of national households live as nuclear families in their own houses. Large families are encouraged by the state as a national policy, and family size is six to eight children. The husband's authority is declining, while the wife is gaining importance as a mother and the manager of the domestic unit. On average, each household employs two live-in domestic servants, usually Asian. Kin Groups. UAE society is family- and kin-oriented. Tribal kinship units play a significant role in social identification and one's standing in the community. Most families prefer to live in the same neighborhood as their kin. Child Rearing and Education. Children are showered with care, affection, and physical contact. They are raised to be respectful toward their parents and elders and grow up to be skilled in interaction with a large number of relatives. Up to age 5, a child is referred to as jahel ("the one who does not know"), and there is a tolerant attitude toward children's behavior. Most families employ maids to share child caretaking, and this has introduced a foreign cultural element to child socialization, although a maid's influence is viewed as negative. The school system has undertaken a greater role in children's socialization, significantly reducing the family's role in this process. Higher Education. The government views higher education as a major instrument for development. The UAE has one of the highest ratios of students entering higher education in the world. There are seven universities and eleven higher colleges of technology. An old mosque in Fujairah. Islam is the dominant religion in the UAR, so mosques can be found everywhere. Emiratis stand close to each other when interacting. It is acceptable for men or women to hold hands. The presence of many ethnic groups has led Emiratis to be tolerant of other social customs, yet they remain conscious of their own customs as markers of cultural identity. Religious Beliefs. Islam dominates all aspects of life. Most Emiratis are members of the Sunni sect. Matters relating to marriage, divorce, inheritance, economics, politics, and personal conduct are affected by Sharia (Islamic) law. Emaritis are tolerant toward other religions, and immigrants of other faiths are allowed to have their own places of worship. Large numbers of Asian and Arab immigrants also follow Islam. Rituals and Holy Places. The main Muslim religious ritual is prayer five times a day. This requires wodou (ablution) for purification. Usually people go to the nearest mosque or pray at home. The rituals involved in the pilgrimage ( Haj ) to Mecca are the most elaborate. One must remove the shoes before entering a mosque. In large mosques, there are separate areas for women. 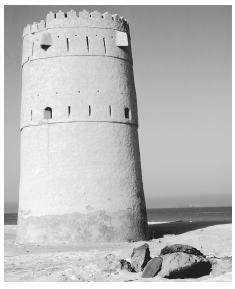 An ancient watchtower on the coast of the United Arab Emirates. health care system with numerous hospitals, primary health care centers, and private clinics staffed primarily by immigrants. With improved diet and health care, life expectancy is now seventy-two years, and there has been a reduction in infant mortality. The extended family provides its sick members with support in the form of frequent hospital visits, and traditional medical practices are still used to deal with mental illnesses. Support for the Arts. The state generously supports writers, painters, actors, and folk dancers. Sharjah is particularly active in promoting culture and was chosen by UNESCO as the Arab Cultural Capital in 1998. Literature. The oral tradition remains strong, particularly storytelling and poetry, and most state events are accompanied by poetry readings. Written literature is increasing in popularity. Performance Arts. Conservative elements of the society still impede women's participation in performance arts. In 1999, the first college for theater arts opened in Sharjah. Emiratis rely on theater and television programs produced in other Arab countries. Abdul Rahman, Abdullah. The Emirates in the Memory of Her Sons (in Arabic), 1990. Abdulla, Abdul Khaliq, et al. Civil Society in the United Arab Emirates (in Arabic), 1995. Al-Alkim, Hassan. The Foreign Policy of the United Arab Emirates , 1989. Al-Faris, Abdul Razzaq. Higher Education and the Labor Market in the UAE (in Arabic), 1996. Al-Gurg, Easa. The Wells of Memory , 1998. Al-Hassan, Yusuf. The Welfare State in the United Arab Emirates (in Arabic), 1997. Al-Mur, Mohammad. National Aspirations: Essays about the Emirates (in Arabic), 1997. Al-Otaiba, Mana. Petroleum and the Economy of the United Arab Emirates , 1977. Codrai, Ronald. The Seven Sheikhdoms: Life in the Trucial States before the Federation of the United Arab Emirates ,1999. Corderman, Anthony. Bahrain, Oman, Qatar and the UAE , 1997. Crystal, Jill. Oil and Politics in the Gulf: Rulers and Merchants in Kuwait and Qatar , 1990. Drake, Diana. Discovery Guide to the United Arab Emirates , 1998. Dubai: A Pictorial Tour , 1999. Dyck, Gertrude. The Oasis: Al-Ain, Memoirs of Doctora Khalifa , 1995. Encyclopedia of the Emirates , vol. 1: Dubai , 1993–1994. Facey, William, and Gillian Grant. The Emirates by the First Photographers , 1996. Ghobash, Moaza. Immigration and Development in the United Arab Emirates: A Sociological View (in Arabic), 1986. Heard-Bey, Frauke. From Trucial States to United Arab Emirates , 1996. Kay, Shirley. 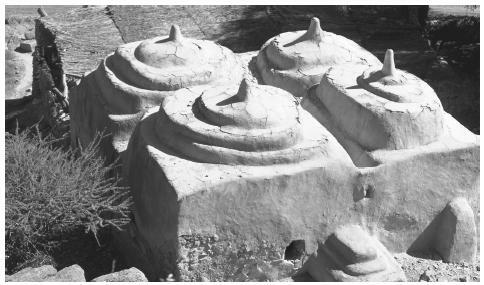 Emirates Archaeological Heritage , 1986. ——. Land of the Emirates , 6th ed., 1992. Khalaf, Sulayman. "Gulf Societies and the Image of Unlimited Good." Dialectical Anthropology 17: 53–84, 1992. Matthew, Jane. UAE: A MEED Practical and Business Guide , 5th ed., 1999. Mohammed Al-Fahim. From Rags to Riches , 1995. National Atlas of the United Arab Emirates , 1993. Nowell, John. Now and Then: The Emirates , 1998. Owen, Roger. "Migrant Workers in the Gulf." Minority Rights Report 68: 1985. Progress of UAE Women . Association of Popular Heritage Revival. Robinson, Gordon. Arab Gulf States , 1996. Spectrum Guide to the United Arab Emirates , 1998. Studies in Emirates Society (in Arabic), 1997. Thesiger, Wilfred. Arabian Sands , 1959. UAE in Focus: A Photographic History of the United Arab Emirates , 1998. Zahlan, Rosemarie. The Making of Modern Gulf States , 1989. TAX CODE OF YOUR COUNTRY. AND HOW TAXATION SYSTEM AFFECTS THE LIFE OF YOUR CITIZENRY AND ITS CULTURAL CONTEXT. This provides a very nice over view of UAE culture and customes. Very nice resource! I am doing a multi-cultural project on this,but I can't find any information.Thanks anyway! I'm working on a project about the cultural factors in UAE society and how they influence the HRM. The info here helped me a lot. Thanks! this was very helpful towards my geography project on the United Arab Emirats, thank you! I did enjoy reading the above article. I have a few friends that I communicate with via the internet who lives in Dubai/UAE and Algeria and I found it very interesting to learn about their culture and beliefs, as mine is totally different. I am english/christian and my culture is totally different, but it was a good article and would be very keen to learn more. Thanks for the update and looking forward to seeing more information of interest. are the muslim women involved in athletics, organized or personal. If they are how do they reconcile the Islamic dress code with athletic activity. How are the women perceived as they participate in sports and how are they compared to other Middle East countries. Thank you in advance. As a foreigner in the country,since muslim dominates a lot,Am i allowed to wear trousers or mini skirts?Thanx for the info it ws rily helpful. I'm an Emirati, Vee : you're allowed to wear trousers but not short + tight ones and mini skirts as long as they are short you cant wear them :) that's according to our religion not traditions..
Nice one. Very useful, interesting and helpful to all who are interested to visit UAE. Really I'm very proud because I live in this great country UAE in spite of that I'm Iraqi. Long Live UAE. nice information i really needed this and it was very helpful. I'm writing a term paper on US State & Country (dubai-UAE)comparsion and contrast of their Mental Health. This has helped me start off my paper but still needing a more info. Can I get more information on how geography has helped in the development of UAE. Anyways a very comprehensive and useful information. This information is very helpful. I'm also doing a project about United Arab Emirates culture. Dispite of this project, I recognized a lot of interesting aspects about their laws, etiquette, and customs. Thaks a lot for this website. I am doing a project on UAE and this was valuable information. Add more please. Thank you! Very comprehensive information. Thanks to the authors and contributors. Great country and plenty of resources. Very much thankful to the Leaders of this country. Really proud to be a resident of this country. Long live and God bless UAE and its people. I am taking International Business Communications class, and this was a very helpful article on United Arab Emirates. Thanks, and keep up the good work. I am designing a fashion range for University, as though I was a buyer for the brand Monsoon. I was wondering if in the UAE there are certain styles or fashions which are not allowed or frowned upon? Also I know in some countries, certain colours are considered offensive? I was wondering if someone could tell me the ‘laws’ of women's fashions in the UAE. Thank you so much for your help. This webpage is great because I am doing a project and this really helps me a lot. I was just wondering if the UAE had a popular style or popstar singer. This is so informative and it does give me a lot more ideas on the situations of uae, it helps so much! Wonderful info! Hope to write about similarities between your culture & mine! Family values, hospitality, & community values! Very interesting info. am very keen to know more about the United Arab Emirates in all domains. Always keep me informed with latest information. Good site. I got to a lot more about United Arab Emirates. I love it. Knowing about this website is sweet. Could not do this project without it. this is such a good website for a country project! so good! love it! Most informative. Straight to the point! I looked at other websites that wanted me to ask questions to receive information. This site just give it. Love it! This article over the United Arab Emirates has a large amount of helpful information, but i would like to see more of the art of the island, over all this was very helpful. I wish they gave more info about Emiratis living in coastal areas. I wish they could give a detailed information about United Arab Emirates and Emiratis living in the coastal region. I would like to work in UAE as it is s good country. Can I know legal website that foreigners can look for job in public and private sectors. This provides a great over view of UAE culture and costumes. Very nice resource! What an interesting article that clearly outlines customs/traditions and life in the UAE. What an excellent resource. This was very informative, especially for someone new to the UAE and wanting to learn more about where I am living. This was really useful and informative, I understood Old UAE and New UAE as well, I am very happy to serve UAE. Absolutely great resource! Really quick question, How do I site this website?